It is estimated that 90% of the victims of the Orlando Terrorist attack that took place in the early hours of Sunday, June 12th were of Hispanic descent and descendants of various Latin American countries—mainly Puerto Rico. There were also Caucasians, African- Americans, and even a couple that was not gay–they just liked to dance salsa. During these difficult moments, we are thankful and blessed to see those who find a way to help, shed their light, and their love on others. We mourn for those in the LGBTQ community and for their safe haven of no judgement to be destroyed as they vanished with it. We send our thoughts to all of those who have suffered due to the escalation of hate that surrounds us. I received a video from someone who was at the Democratic Hispanic Caucus of Florida (DHCFLA) meeting at the yearly summer gala that the Florida Democratic Party puts together to raise money, known as “Leadership Blue Florida” that took place a week after the Orlando attack. This year, the amount raised at the gala was over $800,000 dollars. The video that was sent to me was of an individual who I admire deeply, who has stood up for the Latino community, and in addition has worked to unite all groups that one time or another have been rejected for being “different” in the eyes of many Americans–even though these communities are Americans themselves. According to sources who contacted me about her words, Vivian Rodriguez, the statewide president of DHCFLA spoke in what seemed to be more of a memorial service, saying the name of all of those who lost their lives. After Vivian’s speech, The Florida Democrats place a picture on their Twitter page of Allison Tant, Chairwoman of the Florida Democratic Party, writing on the LGBT board her condolences in Spanish. Allison copies words from a piece of paper and mistakenly writes “oido’ (hearing) instead of “odio” (hate). Yet, why did she not call and offer support in time of action to one of the main leaders of the Florida Democratic Party and who lives in Orlando? An openly gay Puerto Rican woman who represents Hispanic Democrats statewide? If U.S. Senators Marco Rubio and Bill Nelson can stand side by side to be Americans first, why can’t the leaders of Florida Democratic Party show some heart when it is needed? Since its inception, the Florida Democratic Party has had only White Anglo Saxons as their chairs, and from those who have applied, it is not due to not having qualified people of other minority groups apply for it. It is also not the first time the current leadership disregards the Hispanic community under their clock. Over one year and a half ago 50 influential Hispanic leaders of major Hispanic groups asked both parties in Florida for a Bilingual Communications Director in order to make sure that the Hispanic community would receive information. Articles in major newspapers of Florida and political blogs published a story about this. The response from media permitted both parties to promise they would hire someone in several occasions. “We aim to earn the vote of every Hispanic Floridian, just as we aim to earn the vote of every single Floridian. This effort will involve increased Spanish-language outreach, from our website and social media to television advertising and public relations. Through a combination of Party and campaign efforts, we aim to have Spanish-fluent staff working in communities across Florida and with journalists for the 2016 election. I agree with you wholeheartedly that Florida’s future depends on the future of our Hispanic community, and reaching those voters is one of my top priorities”. We received a similar warm letter from Blaise Ingoglia, the Chairman of the Republican Party of Florida stating that he would take action. The Florida GOP hired Wadi Gaitan (two months after our letter) as their Bilingual Communications Director. Wadi has been all over local, state and national news since he started (in English and Spanish). 1) Regardless of their personal opinions of them, they understand that if they reach to the Hispanic market, in their language or by addressing their culture, they will be wealthier at the end because it will only make the company or organization grow. 2) They see the opportunity as more work for them, so the timing never seems right, they say that they do not have the money or it is simply not their priority. Not to be a big predictor. But once again, it seems that the leaders of the Florida Democratic Party (FDP) goes with the second option. Doing the same as always, and expecting different results. Every presidential election, regardless of who is chair, they wait for the Democratic National Committee or the candidate from the presidential campaign to come in with its people and reach out to our cultural communities, usually people who have never lived in Florida and have to start from scratch asking locals who do know. Good Latinos in our community who most of the time do the work and give the information for free for the love of what they believe the party represents, while the outsiders get paid. It cannot be the same this time. This needs to be a permanent position. Everything then died down last year. Some of the Latinos in their party told me to give up, that it was not going to happen. Well, if Democrats are “the party of the minorities” shouldn’t they be the better man and give information to a community who hungers for information? It is still on my Facebook page. After some months of their promise, I e-mailed the Florida Democratic Party Chairwoman asking her what had happened with the bilingual communications director. When we wrote Chairwoman Tant about our request, she had over 1.5 million dollars in the FDP account. Yet, they tell people that there is no money for this position. Even though she mentioned in a text that they would pay that person $40,000 a year. “We are going to be hiring a press secretary and I want to hire someone who is Hispanic. Can you help recommend candidates for consideration? I don’t know if we have advertised the position yet. But please put your thinking cap on”. I thanked her for including me in the process. I recommended a couple of people. One was interviewed. Then, silence. Tuesday, March 8th, 2016 I went to the Democratic National Committee Hispanic Summit which was organized by some great Hispanic Democrats. There was a panel at the summit where Albert Morales, former DNC Hispanic Engagement Director, Vivian Rodriguez, DHCF President, Lucia Baez, Miami-Dade DEC Secretary, Maria Cardona, Democrat and CNN Analyst, and Scott Arceneaux, Executive Director for the Florida Democratic Party was a part of. There was a time for questions and answers. I mentioned that we had an anniversary. An anniversary in which the Florida Democratic Party had committed various times to hiring a Bilingual Communications Director. I asked if they would commit in front of those present in the room to hire one. I received silence from him. There were two more people who spoke. I stood up again. And I asked Scott if he would commit. He said “yes”. I asked: “When?” because the people who were interviewed for the position were told that someone would be hired by the time the FDP had their convention in 2015 and that they would be called. They never were even given a courtesy call back, and no one was hired by the time the convention came by. Mr. Arceneaux said: “soon”. Now, since Mr. Arceneaux said “yes” and “soon” four months have gone by. Some political insiders say that the truth is that they don’t want to invest more in a community that does not turn out to vote. That if they do something, it will be to hire someone closer to August of this year with money given by the DNC and let him or her go after the November election. You see, the problem is not the fact that Democrats do not have great Hispanics. The problem is that many Democrats in leadership positions ignore the great Hispanics they have and do not support them. And even though all the Democrats do is criticize Republicans for being hypocrites. The questions is, who is truly the hypocrite? The party that guides Hispanics to follow their principles, converts them into Republicans, helps them move up and then supports them to become a bilingual presidential candidate in 2016? Or the Party who says that they are for the minorities, with less leadership roles for Hispanics within the party and who make promises that they cannot keep? The time has come for us to no longer take positions of sub-directors. It is time for us to be directors also. I have been blessed to have some great friends and bosses that are Democrats. Yet, I have seen so many Hispanic leaders who were friends of mine ask for the support of the party to run for office and be turned down because their “friends” were running. It just made me nauseous to see qualified individuals thrown into the trash. To be called when needed and used for their skills, asked to work for free and then discard them again for four years. As you can see now, the Florida Democratic Party does not even support Senator Darren Soto, the highest ranking Democratic Hispanic in the State of Florida for the Congressional race in Orlando. When someone asks the FDP to change, it seems the leaders immediately believe that this person is their enemy. We are not. The people who asks them for change are not. 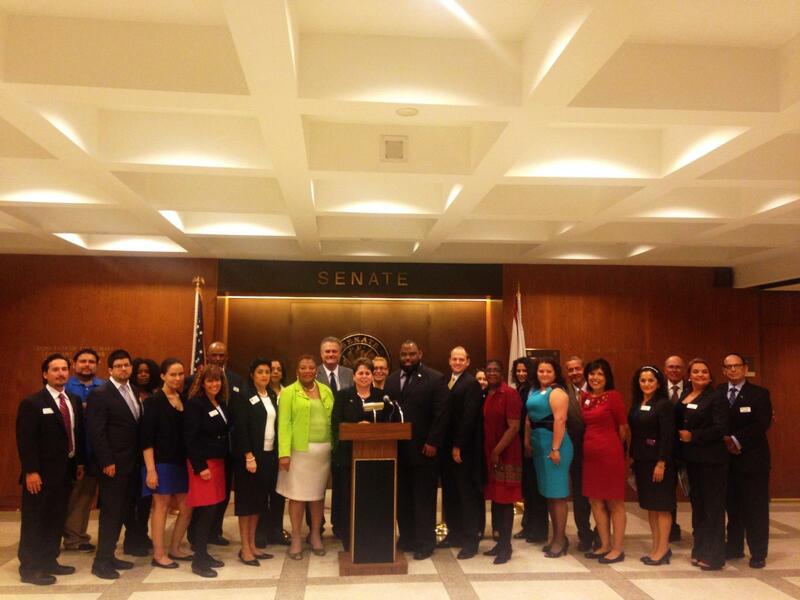 Most importantly, Hispanics within the Florida Democratic Party should not be silent. The Florida Democratic Party should not be a place where their own Hispanic members are afraid to speak out with fear of what those in power may do to them. The Hispanic Democrats I know have so much love for their party, that they fear hurting it by becoming vocal. The stay silent, and hope that if they are good team players, one day, the leader’s eyes will bestow their grace upon them, and finally they will be given the power to help the community they so much love. This situation becomes a vicious cycle and a dependent one. One thing I do know is that many Hispanic Democrats in Florida do hope for is that the leadership changes the sound of their tune. We do not ask for much as Hispanics. But one thing we do ask for is that we are treated with dignity and respect. We hope that the party takes action instead of writing beautiful words on a board or giving promises they do not want to keep. Let us go back to the roots of Latin: Acta Non Verba (Actions, Not Words). The Florida Democratic Party needs to change this for their political party’s sake…if they really want to win Florida. If they wish to see Hillary as their president as they have internally rooted for. The extreme wave of fear and hate towards Hispanics that we see today may limit Clinton’s chances in becoming president, and the current way the FDP is handling situations such as these are truly not in Clinton’s favor. They must change their negligence– for inclusion.